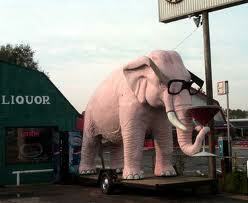 How about a Pink Elephant in Fortville, Indiana? Yep, there it was, sitting next to the highway, wearing black glasses and drinking a martini…with olives! Road tripping across our great country will show you incredible beauty as well as a lot of oddities, but always worth the trip. Want to live near this roadside attraction? Check out my website for homes in the area! To have your shoes repaired? As a woman on the move, I am constantly either wearing down or knocking off the heel cap on my shoes! (For those of you who don’t know me, 99% of my over 300 pair of shoes are stiletto or kitten heeled) It is too expensive to buy new shoes every time this happens, and really lowers your per wear value! I was worried that shoe repair had gone the way of the service station attendant, but lo and behold, they are still around! I am fortunate to live in Beech Grove, home to Eckstein Shoe Store and Repair which continues under new family ownership remaining in the same location it has been for 89 years. These are really terrific people, today, they fixed a pair of heels in less than 10 minutes for $8.56 and I left several other pair for repair. 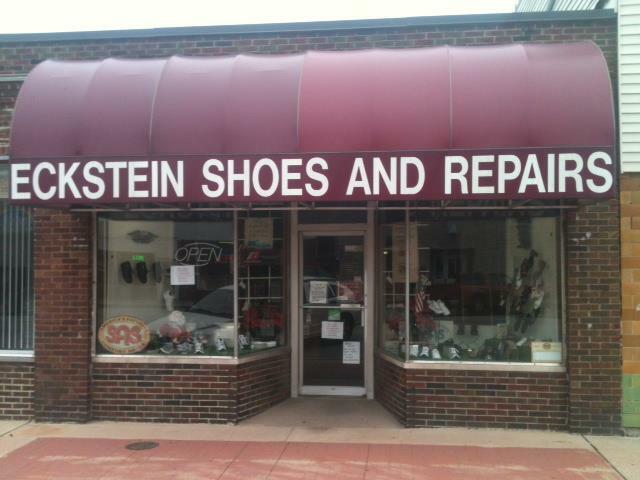 If you want to increase your per wear value and keep wearing those shoes that you love…stop by and visit the great people at Eckstein Shoe Store and Repair on Main Street in downtown Beech Grove! I do believe in ghosts – good ones, like an angel watching over us but not the scary kind. No siree. Don’t wanna look at them at all. I don’t like uncovered windows after dark – there might be someone looking in and I’ll see their reflection. Keep the sound of rattling chains away from me too– that’s spooky. But this time of year it’s all over the place. I read that the amount of Halloween decorations are second only to Christmas. Driving through my son’s neighborhood on the west side – I can believe it! Makes my little jack-o-lantern w/electric light look bad. I only took my kids & grand-kids to the un-spooky hours for the Children’s Museum Haunted House. But when they got older they all went to the ‘real’ ones in Greenwood and Beech Grove. Having some guy chase me around the parking lot with a chain saw is not my idea of fun. We used to do a haunted house for the younger kids at Sunday School (pretty lame by today’s standards I’m sure). The older kids got a kick out of scaring their siblings. And I did dress up in a witch’s outfit and play spooky music one year giving out Treats. My costumes are usually the kind you have to think about, a play on words; like the year I went as the tv show ‘Lost’ with pieces of maps and a compass attached to my shirt. You’d think kids would learn by now how to get away with the pranks too. But a group of boys were stopped in a Walmart when security cameras saw them purchasing large amounts of toilet paper- they were not arrested, just didn’t get to buy it. We stored it up for months just waiting for October 31. I only did the TP thing a couple of times; once at my English teacher’s house – but he turned the porch light on so we had to lay in a cold, damp ditch for a long time. Then once at my Uncle’s house in Kentucky. They’d never heard of TPing so I showed my cousins how to do it. Well, my Uncle was not amused and made us go out and take it all off the trees before we left for church. So much for my hooligan days! Yes, it’s Halloween…haunted houses, costumes and scary movies! One of my favorite “scary” movies is getting an airing on the big screen! On October 26th and 27th the Historic Artcraft Theatre in Franklin will be airing…The Ghost and Mr. Chicken starring Don Knotts!!! Such a classic! Tickets are only $5.00 (2:00 p.m. and 7:30 p.m.) and concession deals are great at the Artcraft – make it an inexpensive outing and visit this great theatre in the heart of downtown Franklin. Local housing performance in the third quarter of 2012 played out much like the first half of the year with impressive amounts of consumer interest and slow, steady price gains. The September Monthly Indicators Report of BLC® listing service data released by MIBOR today reveals that pending sales were up 14.9 percent and closed sales increased by 13.1 percent for the three months ending in September. Closed sales for September alone increase 11.3 percent over last September and pendeds jumped 11.8 percent. Prices were stable but not dramatically higher, reinforcing the slow and steady gains seen throughout 2012. In the third quarter, the median sales price increased 2.0 percent to $131,500. Average sales price inched by 1.2 percent to $166,211. The balance of housing stock continue to stabilize with the months supply of inventory figure down 23.1 percent to 7.6 months. Along with the Monthly Indicators Report, a one-page report of each county within the service area is also provided. In total, these data sets are intended to be a snapshot of the market, providing historical comparisons whenever possible. The data was pulled from the BLC® listing service on October 17. To download the Monthly Indicators report, click here. To view the one-page county reports, click here. Please note, due to the length of the reports, it may take a few minutes to download. If you have questions regarding the data, please click here. Want to talk about what this means to you? want to receive monthly emails regarding the market? Click here to sign up on my website! A close friend was relocating to another city and because of his job, he couldn’t be in Indy for moving day, so I volunteered to cover it for him. Very long day of watching strange men packing his belongings and take them off to the truck. The last item out was the futon frame…I watched it go down the elevator and up the parking garage ramp to the truck in the alley as I left the condo. Now let me preface this by saying I have never seen a futon moved this way, laid open flat, covered in moving pads and taped. The next evening, I met a friend at the condo to fix a light fixture, went went to the courtyard door to let him in…there sat the futon! Still wrapped, still tagged, but sitting outside all by itself, no explanation! I left the details to my friend to work out with the movers, but had to get that thing up the stairs to the second floor, couldn’t leave it just sitting there! What a nightmare…and go back again for them to pick it up…I waited until it was on the truck and the truck pulled out that time! What horror stories do you have to share??? Are you ready to move? Check out my website to see what I can do for you! Sherlock Bones??? Vino Villa??? What’s your favorite business name??? Sherlock Bones Animal Hospital on 116th Street in Carmel – tagline: We’ll solve your pet’s problems! Vino Villa on Madison Avenue in Greenwood – tagline: We have over 450 different wines and 70 different cheeses from around the world, and right here in our own back yard.